KANSAS - Kelly Livgren and the gang . 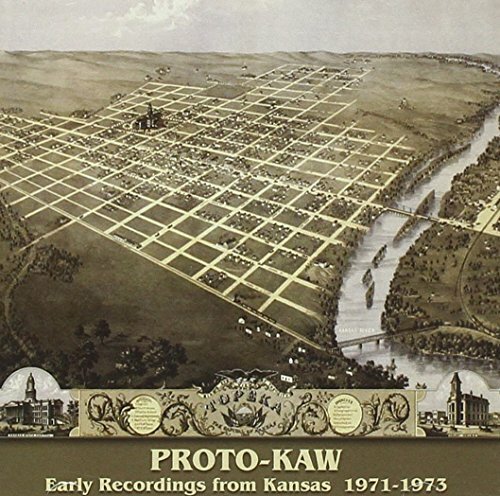 . . PROTO KAW - early "Kansas" - "Eclectic Earwig Reviews Music and More for You!" Kansas playing a song I loved; it was “Can I Tell You.” I recall that night as if it was yesterday. get second chances all the time, and this is one of those sweet returns to the past. sound, would clearly define them as progressive rockers. albums? Their music would follow suit and keep listeners’ attention. they continue to gain more attention with the passing of time. unusual; in fact, the edited version of “Song For America” is noticeably out of sync in a few spots. the band have produced on these titles and I look forward to more (there will be). You may think that these recordings are a crude representation of the legacy of Kansas. If you were thinking that, you are wrong. This collection of early works from the second incarnation of the band titled PROTO-KAW, is a real revelation for longtime fans of the band. Kerry Livgren said in the liner notes that he found it amazing how they were playing such progressive music long before they ever heard bands that they were falsely accused of emulating. Livgren also mentions how they had used cheap recording equipment at the time and this is not a CD for audiophiles by any means. They were working with what they could afford at the time and overall did a fine job creating some incredibly good progressive rock. The tracks are cleaned up nicely to make this quite listenable for the advanced audience of today and they sound exceptional. Genuinely taken aback by the complex tracks they put together so many years ago, this CD came as a pleasant surprise and a real gem to add to my collection. You will hear some advanced music with instruments like the saxophone and flute, creating a jazz-rock fusion that would be expected from bands like King Crimson or early Jethro Tull. There are unquestionably essentials apparent in the tracks that were no longer part of their makeup before they recorded their first major label release. The jazz fusion elements were a big part of their sound back then and I am sure many of you will be surprised with what you hear on this CD. What I expected to hear I did not, instead of stripped down demos of songs that never reached fruition; I heard a band that was making incredibly great music while stretching themselves out musically, just like a true improvisational unit would. Here is the proof that Kansas was a great band before the American audience discovered them. It is too bad that the people in the area they were from did not realize what they had at the time, in the end it did not matter; they became legends in spite of that. You will enjoy this immensely if you are a fan of their music or if you just enjoy prog-rock in general, any way you look at it…this will work for you. Kansas - have returned with a new CD titled Somewhere to Elsewhere. Kansas sound, Kerry can - and he proves this in many places on the album. revival, (Livgren is a born-again Christian)*, than on a rock album. sudden and totally unexpected "death metal-ish" riffs from Williams. Top 10 list - it truly represents everything that is good about the band. would've been a fine ending to the CD. in the music -- no big deal.